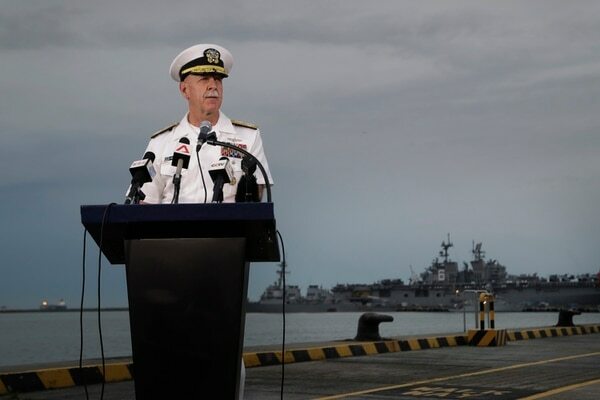 Recent at-sea disasters that led to sailor deaths and massive ship damage came about while the Navy was conducting “the most basic of operations,” Pacific Fleet commander Adm. Scott Swift said in a fleet-wide message Tuesday. Swift’s internal note to officers in charge, obtained by Navy Times, refers to the fatal at-sea collisions involving the destroyers John S. McCain and the Fitzgerald and was issued as further guidance to the one-day “operational pause” that Chief of Naval Operations Adm. John Richardson called for on Monday. That pause, along with a fleet-wide review of Navy operations that Richardson also called for, aims to assess systemic failures that led to the McCain’s collision with an oil barge on Monday near Singapore, and the Fitzgerald’s collision with a merchant vessel off the Japanese coast two months earlier. Swift said the fleet had experienced “a series of unfortunate incidents, some of which claimed the lives of our shipmates,” while conducting basic duties like anchoring, navigation, surface ship contact management and carrier qualifications. Ten McCain sailors remained unaccounted for Tuesday, but the Navy announced that some remains had been found in the ship’s flooded compartments and that Singaporean authorities had discovered other remains. On the Fitzgerald, seven sailors died after the massive container ship known as the ACX Crystal plowed into it on June 17, flooding their living quarters. The Navy has yet to explain how a commercial ship was able to get so close to one of the world’s most high-tech ships. Declaring that the Navy “needs to get to the bottom of this,” Chief of Naval Operations Adm. John Richardson called Monday morning for a global fleet-wide operational pause that seeks to understand the causes of the service’s spate of fatal at-sea collisions this year. Also this year, 7th Fleet’s guided-missile cruiser Antietam ran around in the Tokyo Bay, and the cruiser Lake Champlain collided with a South Korean fishing vessel. Continuous operations cause basic skills to atrophy and give commands a false sense of their overall readiness, Swift said in Tuesday’s message. “The phenomena that, ‘I am at the peak of my game because I have been operating’ leads to overconfidence, complacency and mistakes which in the best case leads to remedial training, and in the worst case of loss of personnel and equipment,” Swift said. Richardson’s review is expected to address the high operational tempo of ships that call overseas ports home, such as those in 7th Fleet. Swift directed each command to take a full workday dedicated to the operational pause and focusing on individual and team fundamentals. He said the meetings should “develop, table-top, and talk through challenging scenarios,” as well as rules of the road, standing orders, operating and casualty response procedures, and other areas. “No one, not even you the CO, is immune from constructive feedback,” Swift said. The Navy’s top officer is eyeing U.S. 7th Fleet based in Yokosuka, Japan, after four accidents in one year have resulted in three collisions, a grounding, seven sailors dead and 10 missing as of Monday afternoon. The officer and enlisted heads of commands across the Navy’s 7th Fleet will hold their daylong seminars Wednesday and Thursday, according to a 7th Fleet command message. Seminar topics to be discussed include situational awareness, stress and fatigue, error chain, external and internal communications, decision making, rules of the road and lessons learned, according to the message. “The seminar format is intended to elicit a facilitated discussion of the navigation and seamanship challenges facing our fleet to ensure that we are taking all appropriate immediate measures to support and enhance Seventh Fleet’s safe and effective operations,” it states. A 2015 Government Accountability Office report found that ships based overseas faced lags in training, maintenance and other issues compared to ships with U.S. home ports. While Navy plans call for a U.S.-based cruiser or destroyer to spend 41 percent of its time deployed or available for deployments, similar Japan-based ships spend 67 percent of their time deployed, according to the report.